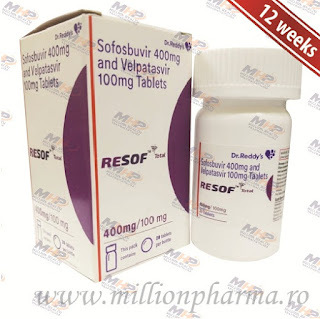 DESCRIPTION HEPCINAT (SOFOSBUVIR 400MG) Hepcinat (Sofosbuvir 400mg) is a prescription medicine used with other antiviral medicines to treat adults with chronic hepatitis C (Hep C) with or without cirrhosis (compensated). Hepcinat recommended with some combination of ribavirin, peginterferon-alfa, simeprevir, ledipasvir, daclatasvir, or velpatasvir to cure genotype 1 to 6 infections. Cure rates are 30 to 97% depending on the type of hepatitis C virus involved. Hepcinat is safe and effective in patient who have had a liver transplant. 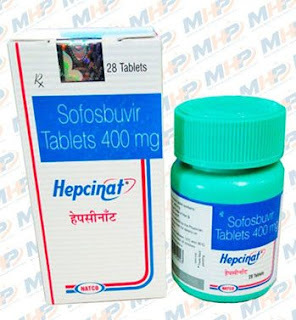 Hepcinat (Sofosbuvir 400mg) is activated in the liver to the triphosphate GS-461203 by hydrolysis of the carboxylate ester by either of the enzymes cathepsin A or carboxylesterase 1, followed by cleaving of the phosphoramidate by the enzyme histidine triad nucleotide-binding protein 1 (HINT1), and subsequent repeated phosphorylation. Dephosphorylation creates the inactive metabolite GS-331077. The half life of Hepcinat is 0.4 hours, and the half life of GS-331007 is 27 hours. It is recommended that Hepcinat/ribarivin combinations be avoided in pregnant females and their male sexual partners in order to reduce harmful fetal defects caused by ribavirin. It is unknown whether Hepcinat and ribavirin pass into breastmilk; therefore, it is recommended that the mother does not breastfeed during treatment with Hepcinat alone or in combination with ribavirin. Hepcinat ( Sofosbuvir ) is on the World Health Organization's List of Essential Medicines, the most effective and safe medicines needed in a health system.